All fire extinguishers must be maintained and in working order (including) in between the annual service. Areas to look out for are: signs of water, foam or powder discharge from the hose of an extinguisher, missing tamper tags or pins, gauges showing low pressure, rust, or any damage. During an annual basic service, an extinguisher is inspected depending on type. Integrity look at the correct pressure, weight of the cartridge and signs of corrosion or damage. We look at all the extinguisher parts such as hoses, valves, pressure gauges, safety devices and mechanisms, to ensure they work properly, and replace ‘O’rings, anti-tamper seals and safety pins/clips. 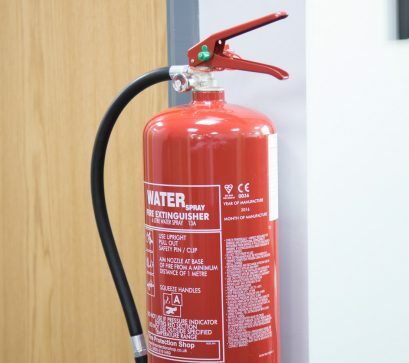 We also look at where the extinguisher is placed, to ensure it is easily accessible, and mounted on a suitable wall bracket or placed in a fire extinguisher stand. We also provide you with a Certificate of Conformity for your records. Integrity is experienced in installing and maintaining fire extinguishers in retail, commercial, industrial and office premises, manufacturing plants and distribution units throughout Birmingham and the West Midlands and also countrywide.